Semi-trucks are seen on the roads and highways across the nation on a daily basis by driver’s everywhere. Some are not entirely sure what is going on within these semis, and others may be more familiar with freight and shipping and may be a truck driver themselves. But most people in America are beginning to understand the importance of these carriers of freight and shipments. Shipping by way of a semi-truck is often referred to as dry van shipping. This shipping method has a number of advantages and benefits, and there are different products that manufacturers and companies choose to ship with semi-trucks. The dry van carriers generally work with those who have specific shipping needs which require a dry van load to haul the shipment. Dry van shipping is able to protect a shipment from the elements because it is enclosed. 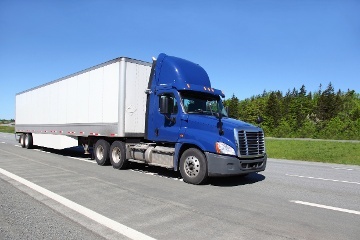 It’s the most common type of freight carrier around, and there are certain specifications that are the norm for trailers that are under the category of dry van. Dry van shipping is the most common type of freight transportation in the US. Dry van trailers, or enclosed box trailers, could be described simply as a box on wheels with doors in the back. It has no temperature control and is designed to carry pallets or boxes of cargo and any type of equipment. Dry vans are versatile in terms of freight shipments, both for local and over-the-road routes. Dry vans are used for moving non-perishable foods and beverages, textile and clothing items, plastic and building products. Because cargo is protected from bad weather, possible damage and theft, dry van trailers are used frequently. Thus, freight claims are usually low. The maximum length allowed for a dry van truck is 53 feet. A dry van trailer can haul up to 45,000 pounds of cargo or 26 standard pallets. According to the National Highway Traffic Safety Administration report, dry van trailers acquire the highest rating (42.3%) of fatal crash involvement every year (partly because of its prevalence on the roads). The type of floor is a sensitive issue for dry van trailers. Usually, hardwood floors are used in dry vans, but it is vulnerable to moisture that can come from freight or through open doors. Both full truckload and LTL freight shippers can benefit from using dry van trailers. Full truckload allows to schedule customized pick-up and delivery, so freight will be delivered safely and on time. LTL shipping with dry vans can bring significant cost savings through shipment consolidation. There is also the option of carriers to have refrigeration systems installed in their dry van trailers. This is absolutely essential for those who are needing to ship items such as food, or liquids that need refrigeration. Those who have needs such as these are able to get in contact with a dry van carrier who is able to refrigerate the shipment.